Interest rates can burden stock investors. 1. How Does the Fed Affect Stock & Bond Mutual Funds? 3. What Factors Influence the Rates of Return on an Investment? The stock market doesn't generally like high interest rates. 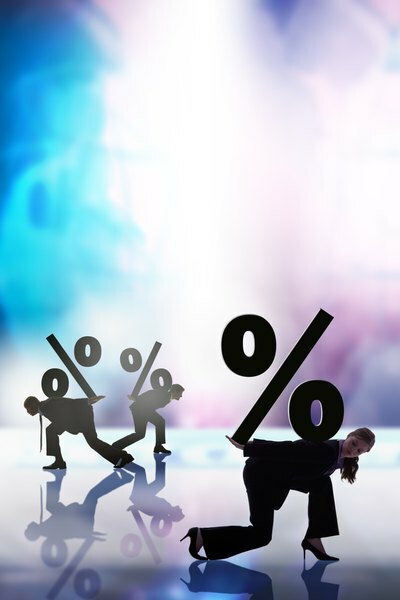 High interest rates can increase costs for companies across a wide range of measures. Increased costs can result in lower profits and subsequently lower stock prices. However, gradually rising interest rates might actually be beneficial for the stock market, as they may reflect positive trends in the underlying economy. Interest rates can indirectly affect stock market prices by increasing the cost of borrowing for companies. The Federal Open Market Committee, a division of the Federal Reserve Board, meets throughout the year to determine the course of monetary policy. One important aspect of this policy is the desired level of the federal funds rate. The fed funds rate is the rate that banks charge each other for overnight lending. However, this rate is also an important trigger for rates throughout the economy. The Federal Reserve Board, known simply as "The Fed," changes the fed funds rate in an attempt to control inflation. Runaway inflation is bad for the economy, as it increases prices dramatically. This impacts both companies, which have to raise prices to keep up with their increased costs, and consumers, who may not be able to afford these raised prices. Increasing interest rates help harness inflation by reducing the money supply. Slowly rising interest rates can have a beneficial effect on stock prices. Rates generally creep up when the economy is booming. For example, in 2018, in the midst of an expanding economy, the Federal Reserve Board indicated that economic conditions were such that rates could be raised. When the economy is expanding in this manner, companies are more profitable. Although costs may rise slightly if interest rates are gradually raised, profit growth generally exceeds these costs. Higher profits, in turn, typically lead to higher stock prices. One industry that specifically benefits from rising interest rates is the financial services industry. Banks make profits from paying depositors lower, short-term rates and lending that money out at longer, higher-term rates. When rates tick higher, banks are able to charge more for loans. Higher interest rates increase the cost of borrowing for companies. This directly reduces corporate earnings. Further, higher interest rates may prevent companies from taking on additional debt for capital expenditures. Without expanding operations, it becomes harder for companies to grow their profits. Both of these factors can trigger lower stock prices. Higher market interest rates can also create a "buyers' boycott" of the stock market, as more attractive investment opportunities emerge. For example, Treasury bonds are considered a "risk-free" asset. If rates rise to the point that an investor can get a "risk-free" rate of 6 percent on a Treasury bond, for example, many investors will choose Treasury bonds over the stock market. While stocks have a higher long-term average return, they are also volatile and carry much higher risks than Treasury bonds. Fewer buyers mean less money to push up stock prices. How Does the Stock Market Influence our Economy? How Are Banks Affected by the Stock Market? Do Stocks Rise When the Dollar Falls?